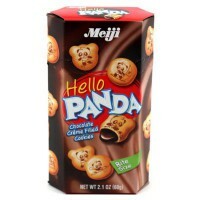 Embrace your wild side at snack time when you indulge in Meiji Panda Vanilla cookies. 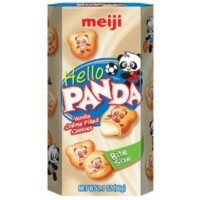 Each cookie is filled with a rich vanilla creme to make this sweet snack even sweeter. 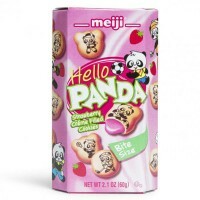 Individually-wrapped packets make these cookies ideal for packing in lunchboxes or for road trip snacking. 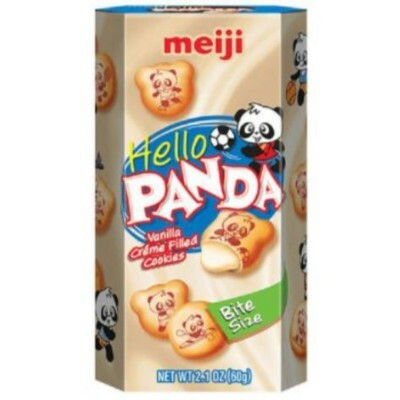 Wheat flour, vegetable oil shortening (palm, canola oil), sugar, lactose (milk), whole milk powder, skim milk powder, emulsifiers E473-E322 (soy lecithin), seasoning (hydrolyzed vegetable protein, dextrin, yogurt powder), salt, malt syrup, leavening agent E500ii, yeast, colors E150-E160a, dough conditioner (papain and enzymes), artificial flavor, made in a bakery that uses tree nuts, peanuts. Nutrition facts (for 100g): calories 538Kcal, total fat 26.9g (saturated fat 11.5g), total carbohydrate 65.4g (sugar 23.1g), protein 7.7g, salt 0.9g.